Shrewsbury Town produced a miraculous comeback to stun Championship Stoke City at the Bet365 Stadium. Tyrese Campbell’s first half double appeared to give Stoke City an unassailable lead. But three ten-minute second half goals produced an astonishing turnaround. The fightback began in the 71st minute as James Bolton reduced the arrears against his boyhood club. Fejiri Okenabirhie levelled the scores from the spot, and Josh Laurent sent the away fans in rapturous with a spectacular winner. Sam Ricketts made one change from the side that lost 3-0 against Charlton Athletic. Ollie Norburn was suspended with Alex Gilliead returning to the fold. Nathan Jones was widely expected to win his first game as Stoke boss, and the home side almost got off to a blistering start. Former Liverpool midfielder Charlie Adam produced a pinpoint free-kick onto the head of Peter Crouch. His attempt cannoned off the post, struck Steve Arnold and trickled over the goal line – but the assistant referee raised the flag for offside. At the other end, Ryan Haynes’ expert cross just evaded the attention of Aaron Amadi-Holloway; as the striker couldn’t make the required contact. But the early proceedings very much belonged to Stoke, and the home side were soon in front. A defensive error from Mat Sadler allowed youngster Tyrese Campbell to pounce. The 19-year-old powered the ball underneath Steve Arnold and into the back of the net. The Potters continued to pour men forward. Nigerian international Peter Etebo engineered himself some room on the edge of the box and managed to fire narrowly wide of the upright. Town were being overrun in the middle of the park, and struggled to carve out any clear-cut chances. Adam Federici clawed away a corner, but Town were unable to threaten the opposition goal in the first half. Instead, Stoke raced into a two-goal advantage. Another defensive mishap this time from Luke Waterfall, allowed Tyrese Campbell to profit once more as he fired a volley beyond the reaches of Steve Arnold. It appeared that the second half would continue in the same vein as the first. Josh Tymon latched onto Charlie Adam’s precise through ball. The ex Hull defender turned possession over to Tom Ince, who missed a golden opportunity by placing his effort wide from close range. An audacious 35-yard free-kick from Charlie Adam cleared the crossbar, as Town were looking to inject some life into the contest. Their first clear opportunity arrived in the 55th minute. Josh Laurent threaded a through ball towards Fejiri Okenabirhie, who couldn’t squeeze his shot beyond the keeper from a tight angle. Stoke continued to pile on the pressure. Charlie Adam’s free-kick was cleared only as far as Sam Clucas, but the midfielder didn’t trouble Steve Arnold. 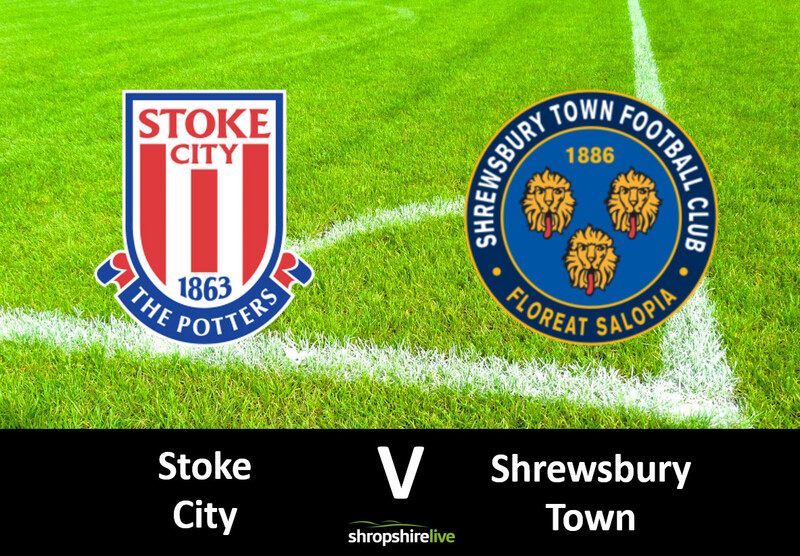 Then, Tom Ince volleyed a Stoke City corner wide, as it became increasingly difficult to see a way for Shrewsbury to get back into the game. However, it only takes one goal to increase the tension on the opposition, and Town found it with 19 minutes of normal time left. James Bolton arrowed a tremendous drive off the post and into the back of the net. And after James McClean missed a one on one at the other end, the marvellous comeback was complete. Josh Laurent’s darting run ended abruptly as Sam Clucas tripped the midfielder. Fejiri Okenabirhie dispatched the penalty with consummate ease as Town resurrected their faltering cup adventure. And it was soon pandemonium in the away end, as the visitors turned the tie on its head with nine minutes to go. Rangers loanee Greg Docherty strode forward unchallenged and drove across towards the advancing Josh Laurent. The midfielder found the target from two yards out to seal a dramatic passage to the fourth round. Shrewsbury’s reward for a tremendous victory is a home tie in the fourth round against Wolverhampton Wanderers – to be played on Saturday 26 January. Town return to league matters on Saturday with a trip to Blackpool, whilst Stoke are at home to Leeds United.